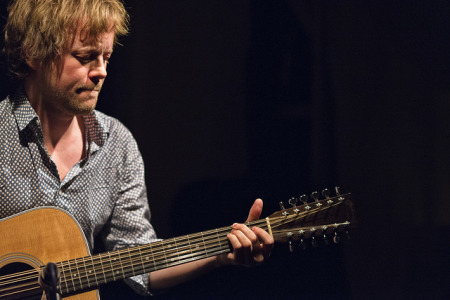 Kim Myhr is an active voice of the creative music scene in Norway, both as a composer and as a guitarist, with frequent performances throughout Europe, Australia, Asia and the Americas. Myhr’s first solo record, All Your Limbs Singing – “A delirious love letter to the 12-string acoustic guitar,” WIRE Magazine – explores the acoustic possibilities of the 12-string guitar, and can remind the listener of early music of Ligeti and of Morton Feldman, but it also contains a driving minimalist energy and simplicity similar to American folk music. Kim was last heard here at the Chapel as one third of MURAL, a trio with Australian wind player Jim Denley and percussionist Ingar Zach. The trio have worked together since 2007, and have released two CDs; the last one, Live at the Rothko Chapel, is a documentation of a continuing relationship with the Rothko Chapel in Houston. In April 2013, MURAL played a four-hour concert there, which is planned to be released in 2014 as a 3CD-box set. As a composer, Myhr wrote “stems and cages” for the Trondheim Jazz Orchestra in 2009, a large ensemble including Sidsel Endresen, Christian Wallumrød, and Jim Denley among others. The music was released on the CD stems and cages in 2010, and received wide critical acclaim. Kim wrote another piece for the orchestra for the 2012 Ultima festival called “In the end his voice will be the sound of paper”, this time featuring the voice of Jenny Hval. More activity is expected for this project in 2014. Myhr works frequently with dance, notably writing music for productions by Italian choreographer Francesco Scavetta, and in 2014 a new collaboration with dancer Orfee Schuijt. Eclectic Seattle composer/pianist/vocalist Stephen Fandrich opens with a set of piano improvisations and original compositions, as well as music by David Milford and John Seman. Fandrich is a long-standing member of Gamelan Pacifica, and for ten years he directed the Seattle Harmonic Voices, a choir devoted exclusively to diphonic singing.